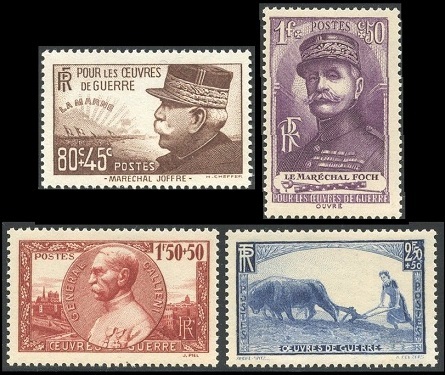 Most of the surtaxed, or "semi-postal", pictorial French stamps of 1939-1940 reflect the French struggle for survival at the beginning of World War II, with the sale of the stamps providing urgently needed funds for wartime government expenses and charities. 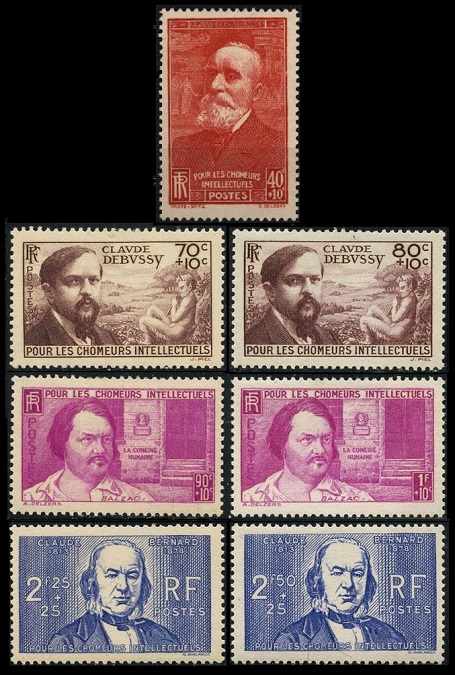 The seven pictorial French stamps shown above (Y&T #436-39, #462-64, Sc. #B86-89A) were issued in 1939 and 1940. The surtax on the stamps was used for the relief of unemployed intellectuals. 40 C. + 10 C. - Pierre Puvis de Chavannes (1824-1898), French mural painter. 70 C. + 10 C. - Claude Debussy (1862-1918), Impressionist Era French composer. 80 C. + 10 C. - (Same). 90 C. + 10 C. - Honoré de Balzac (1799-1850), French novelist and playwright. 01 Fr. + 10 C. - (Same). 2.25 Fr. + 25 C. - Claude Bernard (1813-1878), French physiologist. 2.50 Fr. + 25 C. - (Same). The two pictorial propaganda stamps shown above (Y&T #440-41, Sc. #B90-91) were issued on June 15, 1939. The surtax was used to fund France's re-population campaign. The two designs feature young mothers and their children. The two pictorial stamps shown above (Y&T #451-52, Sc. #B94-95) were issued on February 18, 1940. The surtax provided assistance to the families of mobilized soldiers. The 40 C. + 60 C. denomination features a French soldier and Strasbourg, and the 1 Fr. + 50 C. denomination features a colonial trooper and an African village. The 1 Fr. + 25 C. denomination pictorial stamp shown above (Y&T #453, Sc. #B96) was issued on April 15, 1940. The design features a world map showing all the French colonial possessions. 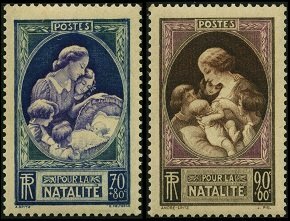 The four pictorial French stamps shown above (Y&T #454-57, Sc. #B97-00) were issued on May 1, 1940. The surtax was donated to wartime charities. 80 C. + 45 C. - Marshal Joseph Joffre (1852-1931), Commander-in-Chief of the French forces on the Western Front in World War I. 01 Fr. + 50 C. - Marshal Ferdinand Foch (1851-1929), the Supreme Allied Commander during the final year of World War I. 01.50 Fr. + 50 C. - General Joseph Gallieni (1849-1916), Military Commander of Paris during World War I. 02.50 Fr. + 50 C. - Woman plowing. The two pictorial stamps shown above (Y&T #459-60, Sc. #B101-02) were issued on May 12, 1940. The surtax was donated to the French Red Cross. The 80 C. + 1 Fr. denomination features a doctor, nurse, wounded soldier, and his family. The 1 Fr. + 2 Fr. denomination features a nurse and a wounded soldier. 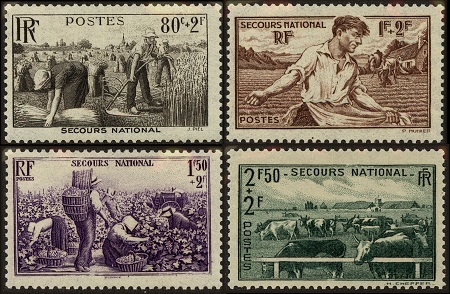 The four agricultural-themed pictorial French stamps shown above (Y&T #466-69, Sc. #B104-07) were issued on December 2, 1940. The surtax benefited national relief. 80 C. + 02 Fr. - Wheat harvesting. 01 Fr. + 02 Fr. - Sowing. 01.50 Fr. + 02 Fr. - Picking grapes. 02.50 Fr. + 02 Fr. - Grazing cattle. The 40 C. + 60 C. denomination stamp shown above (Y&T #446, Sc. #B92) was issued on July 6, 1939. The surtax was used to fund the National Postal Museum. The design features the painting, "The Letter", by Jean Honoré Fragonard (1732-1806), a French artist of the Rococo Period. The 70 C. + 50 C. denomination stamp shown above (Y&T #447, Sc. #B93) was issued on July 20, 1939. The surtax was used to benefit French seamen. The design features a statue of a widow and her children. The 01 Fr. + 02 Fr. denomination stamp shown above (Y&T #465, Sc. #B103) was issued on November 12, 1940. The surtax was donated to a fund for war victims. The design features a nurse with injured children.